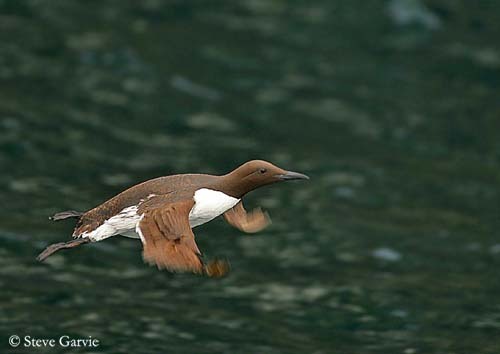 In spite of its penguin-like appearance, the Common Murre is able to fly fast and strongly. It shows great agility when feeding underwater. The adult in breeding plumage has blackish to brownish upperparts, head and neck, and white underparts. The secondary flight feathers are tipped white, forming a narrow white wing bar on closed wings. The flanks are streaked blackish to brownish. The black bill is long, slender and pointed, with orange-yellow inner gape. The eyes are dark brown. Legs and webbed feet are blackish to reddish. Outside the breeding season, the adult has duller greyish-black plumage above. The chin, throat, neck sides and fore neck are white and join the white underparts. We can see a dark line running back the eye. Bill and feet are paler. During the first summer, the juvenile shows a greyish patch behind the eye, becoming white in mid-September. At this moment, they are similar to non-breeding adults. The bridled morph has narrow white eye-ring, extending into post-ocular fine white stripe. 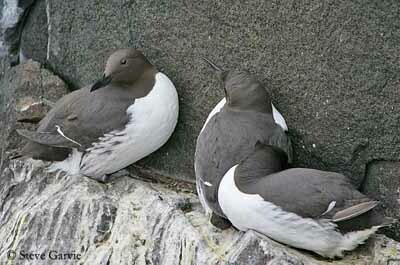 This one is restricted to the Atlantic range and most common in the northern populations. 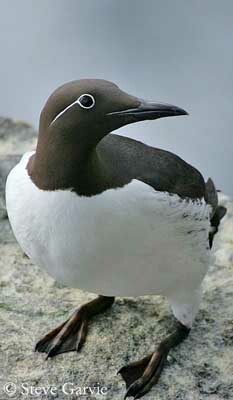 It is often named Spectacled Common Murre. U.a. aalge: E North America, Greenland, Iceland, Faeroes, Scotland to S Norway and Baltic Sea. U.a. albionis: Ireland and S Britain, through Brittany to W Spain. U.a. hyperborea: Svalbard, N Norway and Murmansk to Novaya Zemlya. U.a. inornata: E Korea and Japan (N Hokkaido), N through Sakhalin to Kamchatka. They cross the Bering Sea and reach W Alaska to NW British Columbia. U.a. californica: from N Washington to California. 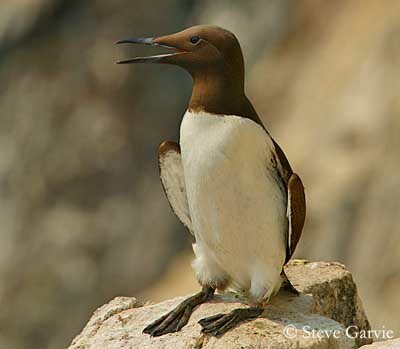 The Common Murre gives prolonged whirring “aaargh” which are the dominant sound on the breeding cliffs. Away from the colonies, this species is less vocal. When on sea, the juveniles utter far-carrying plaintive “peeeooee”. 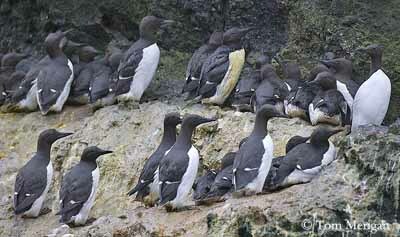 The Common Murre is exclusively marine. 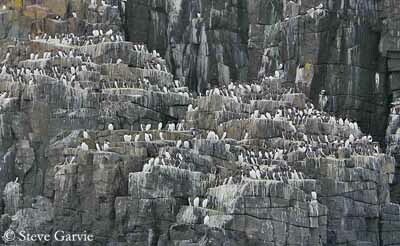 It is visible along the sea coasts with rocky cliffs, and near offshore islands. This species breeds on sea-cliff ledges and lower, on flat islands. 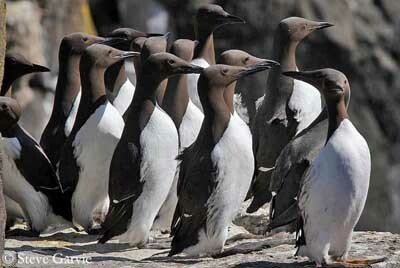 During winter, the Common Murre lives offshore along the edges of the continental shelf. It is found along marine coasts, in bays, and usually in boreal waters. However, some birds frequent the cold waters of the subtropical areas. Concentrations of birds occur at abundant food sources. 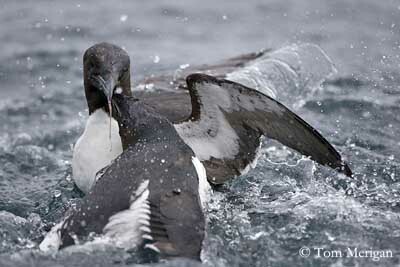 The Common Murre feeds primarily on fish all year round. According to the period, some invertebrates are added including crustaceans, molluscs, marine worms and fish eggs. They forage offshore but within 10-20 kilometres of the colonies, rarely more. 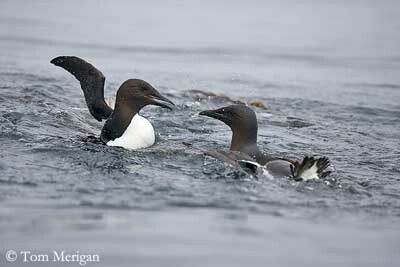 The Common Murre dives during about one minute and can reach depths of 10-30 metres, but they regularly reach 60-70 metres, occasionally more. They are strong swimmers underwater, propelling themselves with the wings and the webbed feet. They are gregarious when fishing and can often be seen swimming in lines or sometimes around the boats. 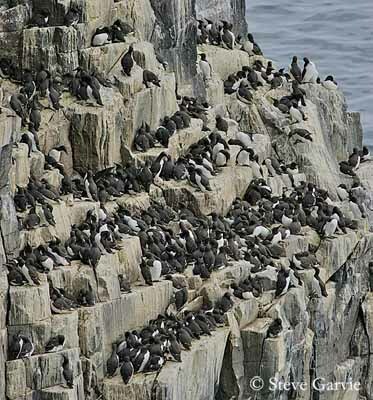 The Common Murre breeds in dense colonies on cliff ledges. The birds can be often in physical contact with the neighbour pairs, and they defend the small territory, the smallest known of any bird! They are noisy and aggressive, and stab at each other with their long, pointed bill, but injuries seem to be rare. The density can reach up to 20 pairs/m². 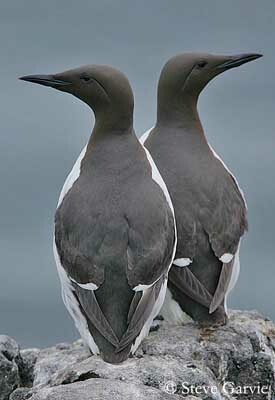 The Common Murre is monogamous and shows high mate and site fidelity. Both mates are commonly seen performing mutual preening, mainly on head and neck feathers. However, extra-pair copulations can occur when there are some unattended females nearby. For this reason, mate guarding is often prevalent, and the male stays close to its mate and attacks strongly the rivals. The courtship displays include bowing and preening. The male throws the head back with the bill pointed upwards in front of the female. 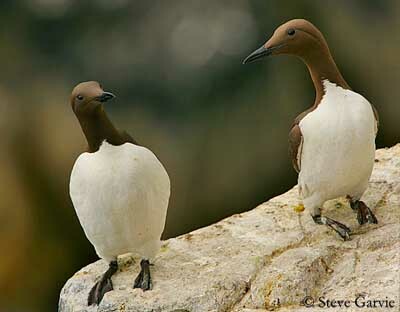 The pair usually arrives at the colony several weeks before the laying. 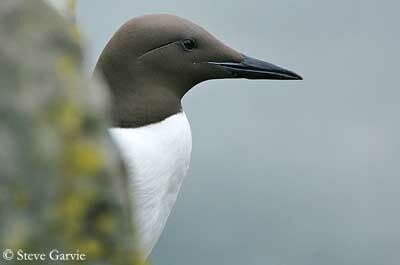 The Common Murre spends the winter offshore at sea, often within the breeding range. They often perform post-breeding dispersion and the northernmost birds move southwards after breeding, according to weather and ice conditions. 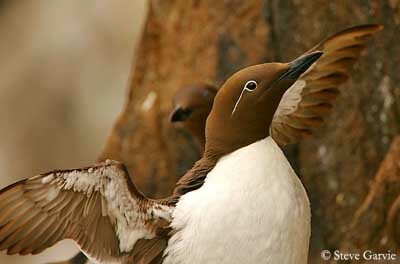 The Common Murre is a strong flier and performs steady wing-beats. The flight is direct. They are very agile when feeding, often turning from side to side. When fishing, they fly low from the surface but over longer distances, they travel high in the air and in large flocks. The take-off needs some running along the surface before to reach some speed and to take flight. The breeding season usually takes place between mid-May and early June. 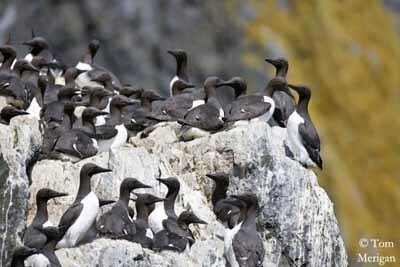 The Common Murres form huge colonies on cliff ledges, or lower on flat islands. They do not build nest and the egg is laid on the bare rock. 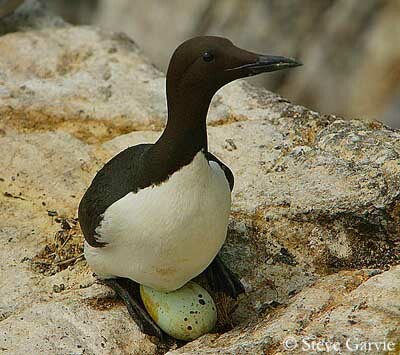 The female lays a single pear-shaped cryptic egg, very similar to the rock. If this egg is lost, a second laying will occur two weeks later. Both sexes incubate during about 32 days. The adults take turns every 12-24 hours. 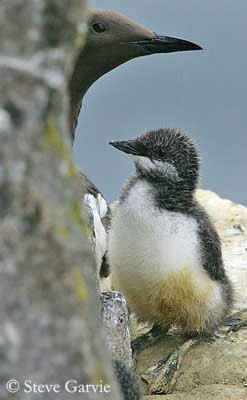 At hatching, the chick is covered in blackish-brown down above and white below. 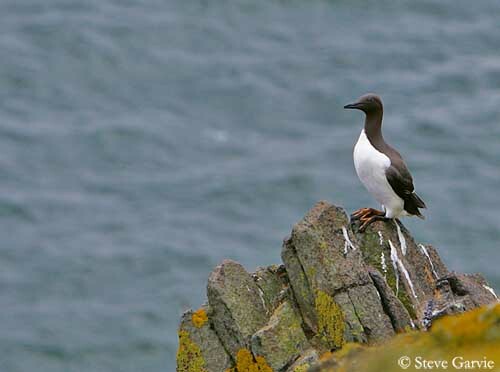 Both parents feed it during 3 weeks until fledging, when the male accompanies the young to the sea. The chick leaves the nest by jumping from the ledge and fluttering down to the sea. The male feeds and cares it until the young is able to fly, while the female remains at the colony. The young can breed at 4-5 years old. 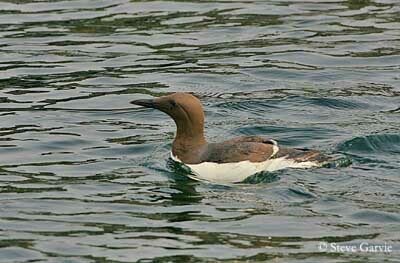 The Common Murre feeds on fish all year round by diving and swimming underwater. It also takes marine worms, crustaceans, molluscs and fish eggs, according to the season. 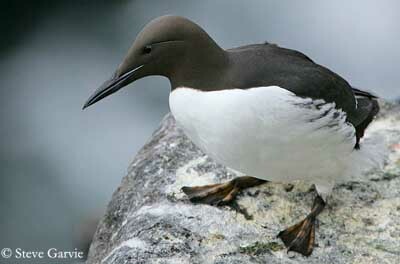 The Common Murre is not threatened at this moment. However, the dense breeding colonies and the bird concentrations at food sources at any time make the species vulnerable to human disturbances, predators, hunting in some parts of the range, overfishing that reduces their preferred preys and oil pollution. Important decreases occurred in the 20th century, and the populations have not recovered.